Had Steven Seagal not collapsed so spectacularly into the parodic fat Elvis phase of his career a couple decades ago, Olympus Has Fallen might have wound up being a really kickass Under Siege threequel. For here is one of the most ludicrous, straight-faced entries in the “Die-Hard-in-a-[Insert Confined Location Here]” action subgenre in years; an absurd throwback to ’90s kill-em-all extravaganzas that honors its forebears while still being a really solid, memorable formula entry. No cheesy fourth-wall-breaking winks or sad attempts to nab the youth market (*cough* The Expendables *cough*), just two hours of skillful hard-R carnage, pyrotechnics and irresponsible ultraviolence. Thank the movie gods for minor miracles. Beefy, hulking Gerard Butler confidently occupies the eye of Olympus’ hurricane, playing Mike Banning, a top-notch Presidential guard (“He moves mountains or dies trying!”) relocated to the Treasury Department after a tragic nighttime accident on an icy bridge. However, he abruptly proves to be the country’s only hope when President Asher (Aaron Eckhart) is taken hostage by a North Korean extremist icily played by Rick Yune. Conveniently trapped alone in the terrorist-ruled White House, Banning stealthily begins picking off adversaries, intent on protecting the President’s son (Finley Jacobsen) and liberating his former boss. He’s aided from afar by Speaker of the House Morgan Freeman, who understands the full magnitude of the arch-villain’s cataclysmic plot against America’s fair people. Eschewing the tedious shaky-cam/rapid fire-editing aesthetic that has plagued contemporary action films, director Antoine Fuqua (Training Day, Shooter) goes for a more classic feel, conveying his considerable mayhem in relatively clean, comprehensible shots. Dodgy CG aside – there is a really cruddy-looking plane crash early on – the action in Olympus feels refreshingly old school, with a good handle on geography and cause and effect. It’s also exciting! And the violence is brutal and impactful (critics who fretted over Zero Dark Thirty’s portrayal of torture may have an aneurism watching Banning interrogate two bound-and-gagged goons). The script, by newcomers Creighton Rothenberger and Katrin Benedikt, won’t win any awards for its clunky dialogue or logic, but there’s genuine rising tension; the more things go wrong, the more we’re pulled in and the climax doesn’t disappoint. As a tough-guy hero, Butler isn’t one of our more charismatic stars. That said, his terse delivery and blunt force physicality serve him quite well here. He’s a dependable lead, with a few choice quips, who we believe is capable of stopping a small army single-handed. 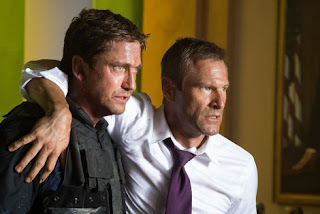 Offering strong support is Eckhart, as the resilient, iron-willed commander-in-chief, and Dylan McDermott, demonstrating amusingly snaky attitude as an aging Secret Service man. Freeman, Angela Bassett and Robert Forster cash paychecks with admirable gravitas as Banning’s top-rank advisors, while a gutsy, electric Melissa Leo – seemingly unaware that she’s acting in a big, dumb B-movie – compellingly endures horrific trauma as the captive Secretary of Defense. Look no further for a portrait of true professionalism, folks! Silly and energetic, this picture should make for a great opening-weekend crowd experience, where its unironic blend of overkill, cornball flag-waving and endearing over-earnestness guarantees to produce no shortage of laughs and fist-pumping enthusiasm. It’s often easy to dismiss films like this, but Fuqua has crafted a fun shoot ‘em up and it’s worth recognizing a job done pretty damn well. 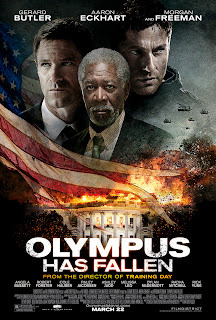 Now, will someone please get started on the inevitable (and welcome) sequel, Olympus Has Fallen Harder?